This workshop was brought to Cal State Fullerton in collaboration with the 5 Gyres exhibition being hosted in the Titan Student Union Galleries and hosted by Day Job Projects. For the project, invited artist Heather Bowling used the art of printmaking to comment on the mass production of the plastic materials that are now clogging our waterways and causing disastrous effects on the environment. 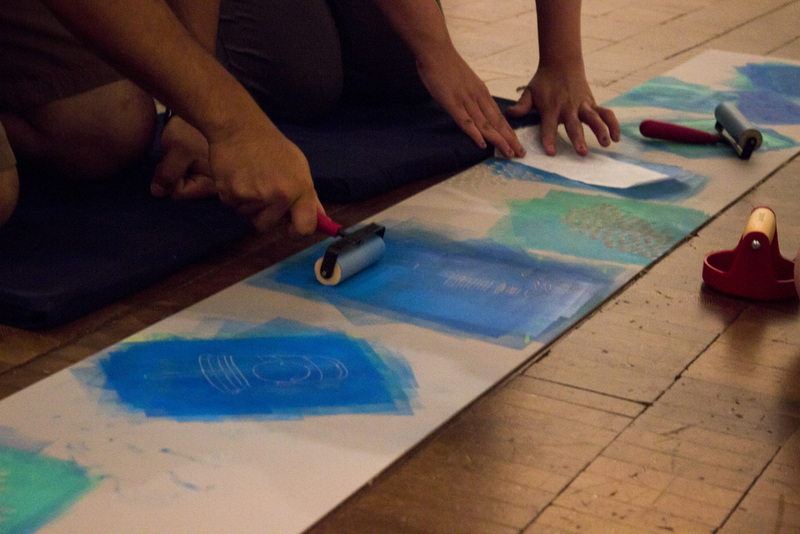 More of a creative environment than a structured classroom, the event included two interactive elements in which attendees learned the art of relief printmaking while navigating the treacherous waters of the issue of pollution in our oceans. First, viewers were invited to assist in creating a life-sized replica of a trash gyre. Participants were taught how to both carve and print linoleum blocks with imagery of plastic trash found in the oceans; which, once printed, were added to a mural of a trash gyre. The second activity allowed visitors to learn how to use a printing press and left them with a memento of the event - a print to take home with them, as a reminder to use and consume less plastic goods.